According to IAAF press release, Twenty-four cities around the world are getting ready to be part of the largest 24 hour one-mile multi-city run to celebrate Global Running Day on Wednesday 6 June 2018. The IAAF Run 24:1 will unite thousands of amateur runners as they outrun the sun in a series of linked 1-mile runs starting in Auckland, New Zealand and ending on the other side of the world in Vancouver, Canada. Spurred on by elite athletes as City Team Captains, IAAF Run 24:1 will commence at 2pm local time (GMT +12) in Auckland, cross Oceania to Melbourne, into Asia via Tokyo to Beijing and Bangkok. Then in to Delhi, Minsk and Ramallah in Palestine before heading to Africa via Addis Ababa and Johannesburg, returning to Europe through Nice, Berlin and London and dipping back into Africa through Rabat, Abidjan in the Ivory Coast and Cape Verde. The run then crosses the Atlantic to the Americas via Sao Paulo and into Buenos Aires, Havana, Toronto, Lima, Mexico City and the City of Angels (LA) before ending the day with the final race in Vancouver on Canada’s west coast. Partnering with sports ministries, city governments and race organisers, the IAAF’s Member Federations will bring together 24 cities across 15 time zones creating a unique continuous 24 hour global celebration of running. “Our Member Federations have been exceptional in offering to coordinate and organise this new global event. My thanks to all of them for making this campaign happen and to the race organisers and cities who have all come on board so enthusiastically,” said IAAF President Sebastian Coe. And special messages of encouragement and thanks will be sent out to participants from a host of athletes including Christian Coleman, Emma Coburn, Karsten Warholm, Elijah Manangoi and Dawn Harper-Nelson. 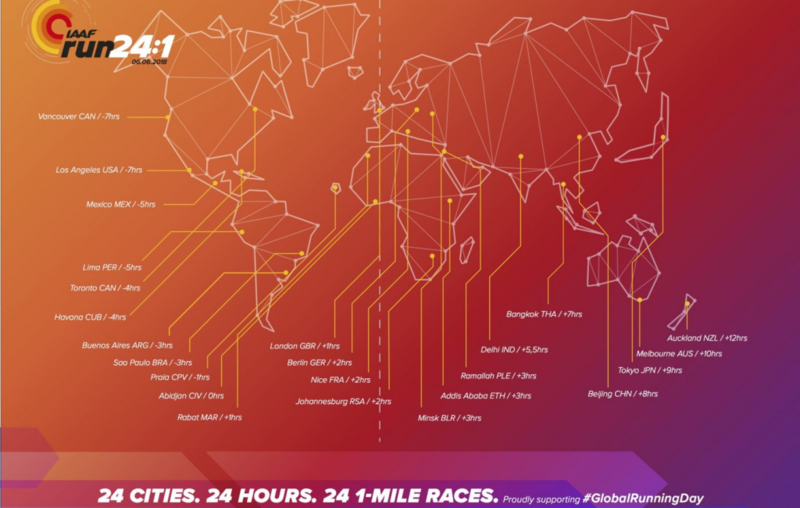 All 24 races of the IAAF Run 24:1 may follow the run as it chases the sun across the world on Twitter, Facebook, Instagram and https://run24-1.org/ . Next articleFootball Transfer Rumors: Is Cristiano Ronaldo Leaving Real Madrid?